Opening times Tue–Sat noon–2.30pm, 5.30–10pm. Closed Sun & Mon. Food served Tue–Sat noon–2.30pm, 5.30–10pm. Closed Sun & Mon. Pre-theatre times Tue 5.30–10pm; Wed–Sat 5.30–6.30pm. 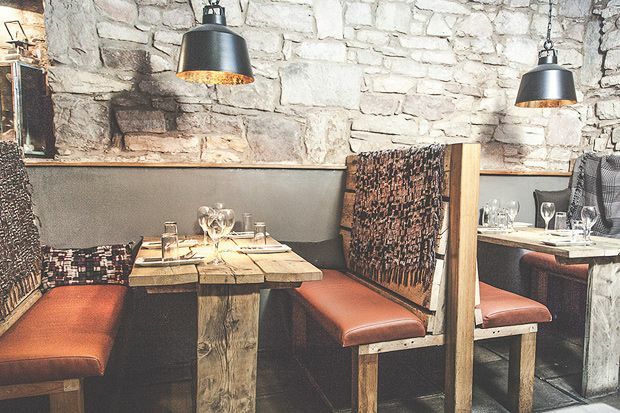 Basement bistro packed full of rustic charm with a confident kitchen showcasing the best of Scotland’s larder. Setting the scene perfectly, the entrance foyer of this Alva Street basement bistro doubles as a kitchen larder packed full of family-made chutneys, pickles and preserves. A series of timber and stone-clad nooks and crannies combine to generate a refined rustic charm, with fabric throws draped across sought-after booths and an appealing roof-lit raised section to the rear. Striving to educate their diners about the quality of Scotland’s harvest, the seasonal menu refreshes monthly, showcasing a hand-picked range of regional producers and foraged goodies. Spiced pear and apple vodka aperitif kicks off a reassuringly compact dinner offer with pork rillettes or Arbroath smokie pâté leading to sage infused guinea fowl saltimbocca. Coley fillet with sea purslane and mussel broth appears from a confident kitchen alongside Dunsyre blue cheesecake with honeyed cobnuts and a poached quince tarte tatin. A carefully sourced old world wine list supports a daily changing lunch offer, with a specials board featuring nose-to-tail dining and a popular Friday night steak and craft beer deal.